Byzantium was a pragmatic and down-to-earth culture—it developed sophisticated systems for taxation, justice, administration, and military deployment—and it also exhibited prowess in science and technology. In his new book, A Cabinet of Byzantine Curiosities: Strange Tales and Surprising Facts from History’s Most Orthodox Empire, Anthony Kaldellis aims to capture this side of the Byzantines. 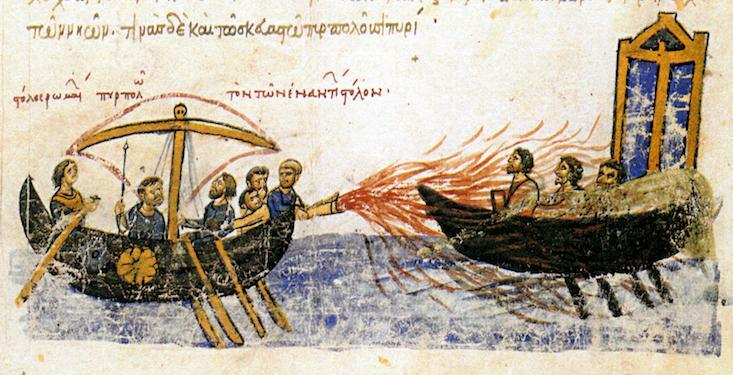 Byzantine military inventors perfected Greek Fire, a combustible liquid like napalm that could be hurled at enemy ships (or lobbed against land armies as hand grenades); a Byzantine philosopher made two synchronized clocks, placing one at the frontier and one in the capital, so that messages could be sent across Asia Minor via a network of fire signals, each message keyed to the time of day or night that it was sent; and Byzantine theologians included ancient Greek science within the basic curriculum of learning that aspiring religious thinkers had to master. Follow the link to read about six notable successes (and failures) of Byzantine science and engineering.